Untouched for centuries, Morocco’s deserts are catapulting the country into solar-energy superstardom. Once a backdrop for epic productions such as Lawrence of Arabia and Game of Thrones, the walled city of Ouarzazate will soon be home to the largest concentrated solar power (CPS) plant in the world. Over 800 curved mirrors that reflect light are used to track the sun progressively through the day. As this happens steel pipelines carrying a ‘heat transfer solution’ (HTF) eventually reach 393C degrees (739F), when the solution is mixed with water to create steam that turns energy-generating turbines. Because the energy is also stored via this process, the plant continues producing energy even at night. When the next stages are completed in 2017, the entire project will produce 580 megawatts (MW) at peak, enough energy to power a million homes. The science behind these dizzying figures works using solar thermal energy technology. Morocco is the largest energy importer in the middle east, and relies heavily on imported fossil fuels, around 97%. The plant will cut energy costs dramatically, and could lead to Morocco being able to sell its renewable energy all around the world. 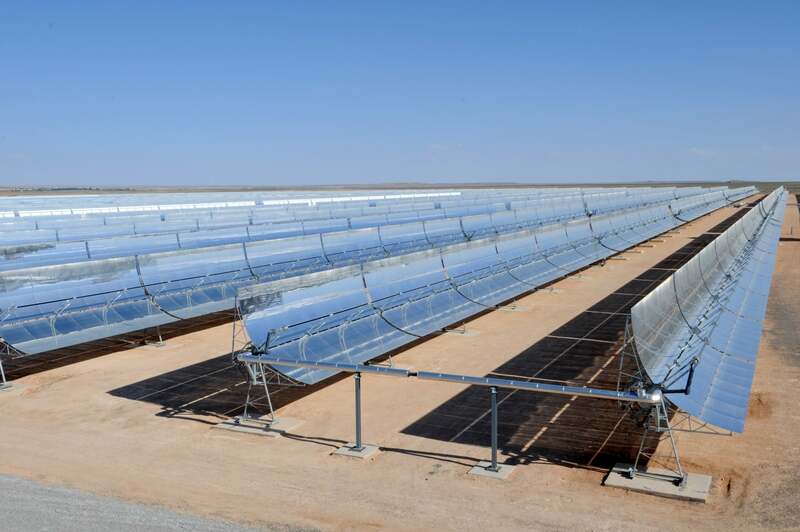 A significant development took place this week in Morocco when King Mohammed VI connected the first phase of the Noor concentrated solar power complex to the country’s grid. Totalling 160 megawatts (MW), it can now operate at full capacity for three hours without sunlight. Lauded as “a shining example of African self-sufficiency and progress”, the final phases are expected to be completed by 2020. Tags: Biofuels, Clean energy, Climate, Concentrated solar power, Environment, Renewable energy, Solar energy.